Published in Rafu Shimpo, December 14, 1955. 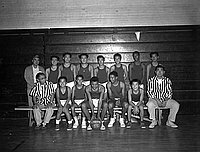 Group portrait of the combined multi-ethnic basketball team of Hound Dogs-1, Eastside Major champions of the Nisei Optimist sponsored basketball league, and Hound Dogs-2 in front of closed bleachers in gym at Roosevelt High School, Los Angeles, California, December 17, 1955. Twelve boys dressed in uniforms of dark tank tops and white shorts pose in two rows between two men in striped shirts in front row and man in sweater in back row, left. 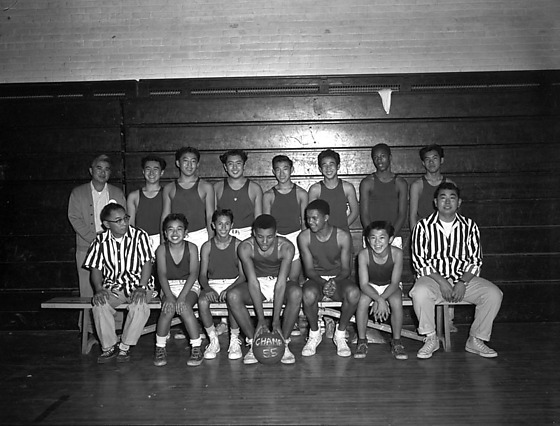 Lanky boy in front row, center holds a basketball at his feet, "Champ 55". They are identified: front row, Referee Togi Okata, Paul Shishima, Bob Perea, William Chiles, Tim Littlefield, Shinji Hososawa, Referee Yashito Kido; back row, Ronnie Tanimoto, Kanji Sadamoto, Norman Inouye, Howard Sakamoto, Ed Itagaki, Ulato Lee, Koki Nakazawa. Typed on original negative envelope: Roosevelt Hi (GYM).